Urban Initiatives – Baby It’s Not so Cold Outside Thanks to Knoll! Baby It’s Not so Cold Outside Thanks to Knoll! Even with the winter snow that blankets Chicago, urban Initiatives is still finidng ways to get great physical activity every day! that’s why Claremont recess with urban initiatives is still going outside when temperatures drop. still, a chicago winter is a tough outdoor recess partner, which is why Claremont teamed up with knoll, inc. for a coat drive to keep Claremont kids Warm all winter long! Jennifer Graham lead a team at Knoll that gather over 40 coats, mittens, gloves, and hats, as well as a few other items to donate to the kids at Claremont. All the kids at Claremont were thankful for the coats, especially this youngerster who got a sweet new Blackhawks jacket. “We’re so lucky to have partners like Knoll that want to do something positive for our community,” said Ms. Stinson, the Claremont principal. 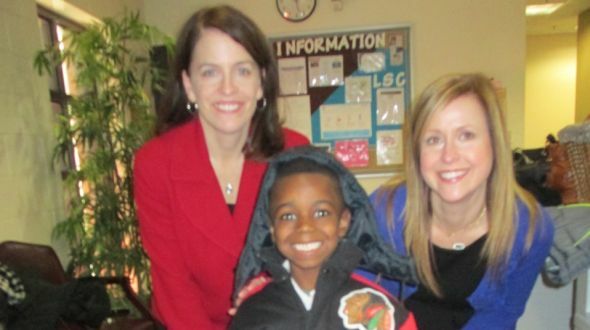 With the new coats, Claremont kids will be able to enjoy the fun parts of the Chicago winter! As health experts recommend, getting fresh air is a key to avoiding sickness during the winter. We also know that being outside allows greater opportunity to get the blood pumping so students can come back to class ready to learn. Still, not every kid comes to school with the proper outdoor attire to stay warm and have fun. Because of the great work of Jennifer and the Knoll team, now Claremont can get more physical activity and be healthier all winter long. A big thanks from Claremont and Urban Initiatives to Knoll for making it happen!